If you’ve taken a load of trash to the dumps here in Tracy, you can’t avoid the solid bump of crossing what appears to be an abandoned set of railroad tracks protected by mute crossbuck warning signs a hundred or so feet down MacArthur Drive south of Linne Road. The tracks are seldom used but are not entirely abandoned these days. Occasionally — very occasionally — the Union Pacific will spot a couple of freight cars loaded with steel coils there, alongside the Calaveras Materials rock grinders and the Teichert Aggregates entry gate on MacArthur. If you pull up along the road there — being careful not to get hit by either garbage trucks or the rare UP switching operation — and have a look down those tracks, you’ll see that they follow almost a straight line out to Corral Hollow in the foothills west of Tracy. At least, those tracks once followed an almost straight line out to Corral Hollow. These days, they come to an end under leftover gravel from the pits, just beyond the tree that’s left of center in the above photo. At one time, however, and actually not too long ago, those tracks carried gravel, coal, clay bricks and manganese from the pits and mines that surrounded them, all the way from the old mining towns of Tesla and Carnegie up in Corral Hollow to the railroad junction at Carbona, about eighteen miles away as the crow flies. 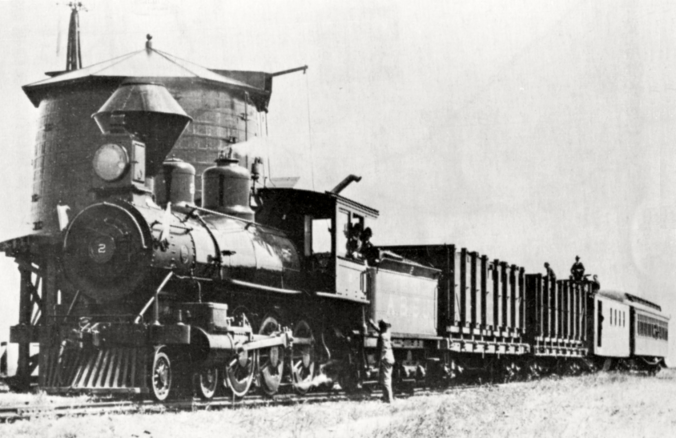 The railroad was known as the Alameda & San Joaquin. Construction began on the line in 1895 at Stockton, while grading work got underway for the A&SJ’s roadbed into Corral Hollow at the opposite end. From Carbona its rails wound in a gentle counter-clockwise arc through Lyoth, Nilegarden, Mossdale, along the edge of Manteca, then up through Lathrop and French Camp and into Stockton, where the line terminated at Stockton’s deep-water channel, a location perfectly suited for the A&SJ to transfer its cargo — mostly soft Tesla coal in those early days. 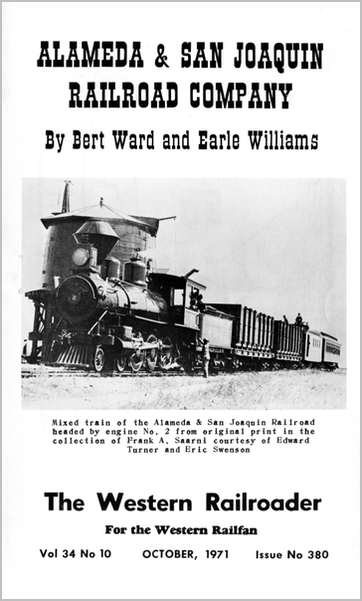 Following is the text of “Alameda & San Joaquin Railroad” by Bert Ward and Earle Williams, which was published in the October 1971 edition of The Western Railroader. Bert Ward was a railroad conductor as well as a railfan and photographer of legendary repute; Earle Williams (1898–1983) came to Tracy at the age of twelve and graduated from Tracy High School. You could say that Earle had gravel in his blood – he began working in the aggregates industry when he was 16, and he founded the Kerlinger gravel pit and plant (on Corral Hollow Creek, adjacent to Tracy Airport) in 1946. Mr. Williams was deeply involved in a variety of local history and civic organizations, including the Tracy Chamber of Commerce and the West Side Pioneer Association. He was widely known as the preeminent historian in southern San Joaquin County, and he extensively chronicled Tracy’s earliest days. Williams Middle School on Tennis Lane in Tracy was named in his honor. In the background of the Western Pacific Railroad of today is a small railroad called the Alameda & San Joaquin Railroad, one of a very few acquired by the Western Pacific during the construction of the last trans-continental link to California. This little coal railroad was known to its employees as the “Andy & Sam Jackson” and was but 36.6 miles in length from the mines at Tesla to the coal bunker at Stockton. Coal was its main reason for being, but earth from the mines and nearby pits provided an excellent clay for the making of bricks, pottery and tile pipe, a high grade of silica sand made fine glass and huge gravel beds provided gravel and sand. The story begins with the discovery of traces of coal on New Year’s Day 1857 by Edward B. Carrell and Captain Jack O’Brien on O’Brien’s sheep ranch at the extreme west end of the gulch of Corral Hollow in Alameda County, adjoining the San Joaquin County line. The mine location was about 30 miles airline southwest of Stockton and some 12 miles southeast of Livermore. There are three passes through the last ridges of the Diablo Mountains, a spur of the Coast Range, as one descends into the San Joaquin Valley from the West. The north pass is the Livermore through which the original Western Pacific was built in 1869. The station at the summit was named Altamont at that time. This name is familiarly applied today to this range, and the name of Diablo has almost been lost ln time apart from the mountain of that name to the north. In later years the present Western Pacific, bearing the same name of the unrelated first line which became part of the Southern Pacific, built through the same pass on a gentler grade. The southern-most exit was the one through Corral Hollow, a link in the old Spanish trail from Rancho San Antonio (Oakland) to San Pedro in the southland. Patterson Pass was called by the Spaniards “Paso de en Medio” (Middle Pass) because it was between the two other openings in the Diablo range.